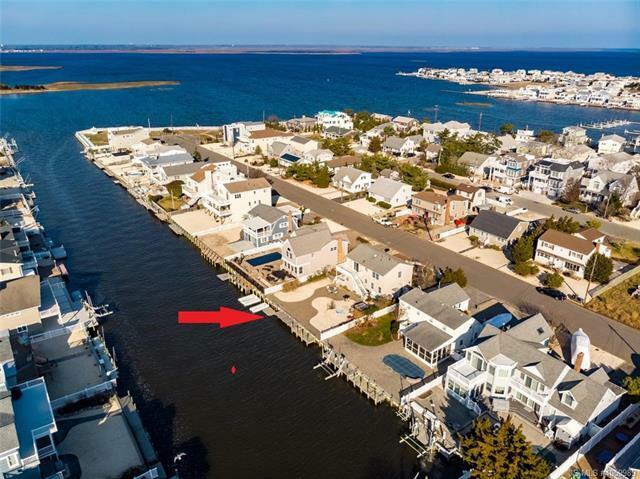 DOCK AT YOUR DECKâ¦In this nautical neighborhood where waterfront living is at your doorstep with direct access to the bay while Surf City Marina is only 3 streets away, along with easy access to the Causeway! Boat lovers will enjoy unlimited waterplay at this unique contemporary offering 60 feet of waterfrontage with a vinyl bulkhead, 2-tier dock, floating dock and jetski ramp. Party all summer in the sunny backyard with large Jacuzzi Hot Tub and paver patio surrounded by flowering shrubs and trees that provide peaceful relaxation in the privacy of your vinyl fenced yard. The open living/dining area accommodates large family gatherings with French doors leading onto covered deck. With built-in efficiency and natural wood cabinetry, this kitchen offers ample storage and counterspace with easy access to the decking for those summertime parties. The convenient first level bedroom is perfect for guests. (cont'd), The spacious bonus second floor family room is designed for casual shore living with sliders opening to fiberglass decking overlooking the backyard and lagoon while enjoying gorgeous sunsets. Serenely simple, the main suite-spacious yet intimate-is a private place for quiet times with partial bayviews. With 2 more spacious bedrooms, thereâs plenty of room for family and friends, along with a hall bath for convenience. Thereâs also an excellent rental history and income for those avid investors. From waterfront living at its best with direct bay access, to a well-maintained home with room for the whole family, to excellent income for those investors, this home is too good to last long! Prime Location: Realistic Price! Call today!